A while back my employer sent out an email, encouraging everyone to submit their own photos for a Contact 2009 show that would feature the winners in our grand atrium. There were two categories you could enter: one for stuff shot on location and another featuring the employees themselves. I submitted three images in the first category. None was chosen. But an editor from Toronto Life, perhaps she was one of the judges, remembered them and had a colleague contact me this week about using it in the magazine’s August issue. 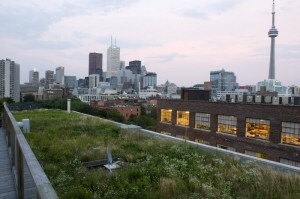 The image, pictured below, has been popular — a similar one already aired as the credits rolled on The National and was part of my feature on green roofs published in 2007.